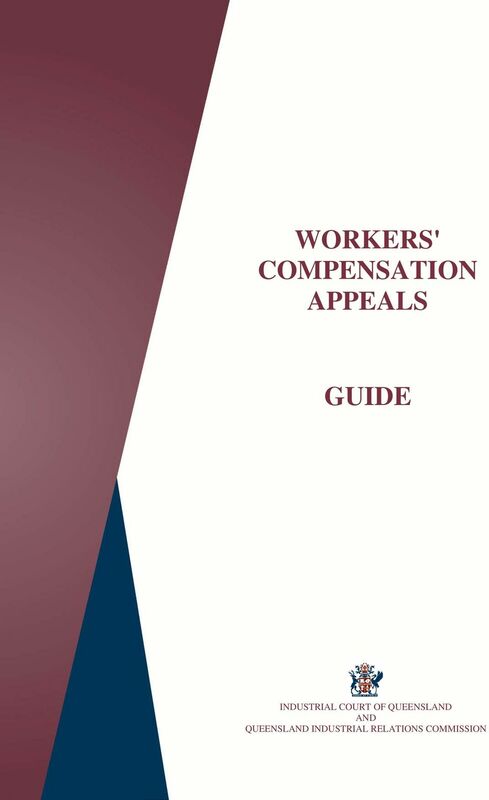 Download "WORKERS' COMPENSATION APPEALS GUIDE INDUSTRIAL COURT OF QUEENSLAND AND QUEENSLAND INDUSTRIAL RELATIONS COMMISSION"
6 5 whether the psychiatric injury is a secondary injury to any physical injury or whether it is a stand-alone injury; whether the psychiatric injury arose out of, or in the course of, employment; whether employment was a significant contributing factor to the psychiatric injury; What Contentions should be included in a Statement of Facts and Contentions when dealing with a psychiatric and/or psychological injury which can be excluded if it arose out of, or in the course of, reasonable management action taken in a reasonable way? When drafting a Statement of Facts and Contentions, the Appellant and/or the Regulator must attempt to summarise the issues in contention between the parties in a clear and concise manner. 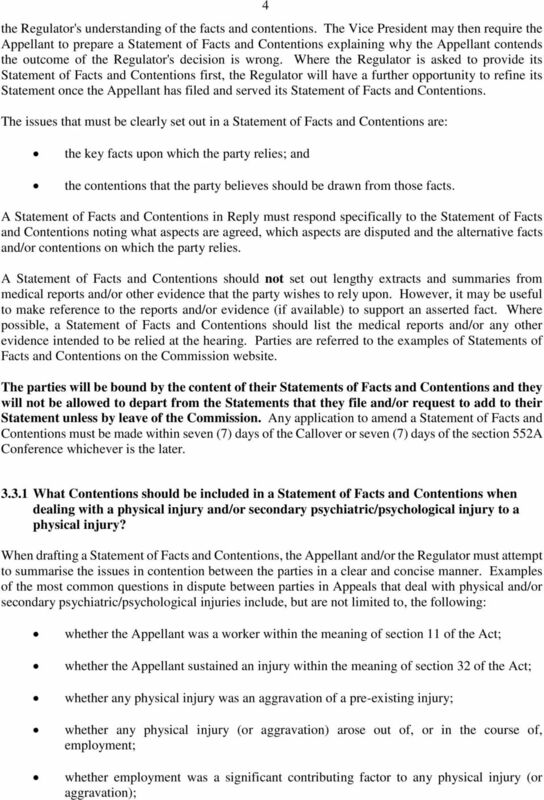 Examples of the most common questions in dispute between parties in Appeals that deal with psychiatric and/or psychological injuries include, but are not limited to the following: whether the Appellant was a "worker" within the meaning of section 11 of the Act; whether the Appellant sustained an injury within the meaning of section 32 of the Act; whether the psychiatric injury arose out of or in the course of employment; whether employment was a major significant contributing factor to the psychiatric injury; whether the psychiatric injury is excluded because it arose out of or in the course of reasonable management action taken in a reasonable way; and whether the psychiatric injury is excluded because of the perception of the worker's expectation or perception of reasonable management action being taken against the worker. 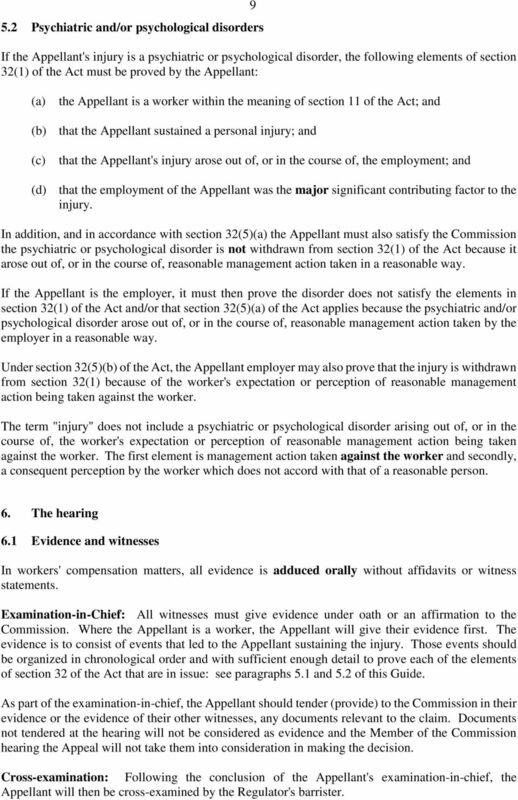 If the Appellant is a "worker" as defined in section 11 of the Act, the Appellant will need to identify each and every work event the Appellant asserts led to the sustaining of the psychiatric/psychological injury for which the Appellant claims workers' compensation in their Statement of Facts and Contentions. Such Appellant are reminded once again they will be bound by their Statement of Facts and Contentions so care needs to be taken in completing such a Statement. 3.4 List of Witnesses The Directions Order will generally include a provision for the filing of a List of Witnesses that each party intends calling to give evidence at the hearing. Both the Appellant and the Regulator will be required to provide their List of Witnesses with the Appellant being required to provide their list first. The List of Witnesses should also be reflected in the Statement of Facts and Contentions. By the time the List of Witnesses is filed and served, in accordance with the Directions Order, it should accurately reflect the names of all witnesses who will give evidence at the hearing. 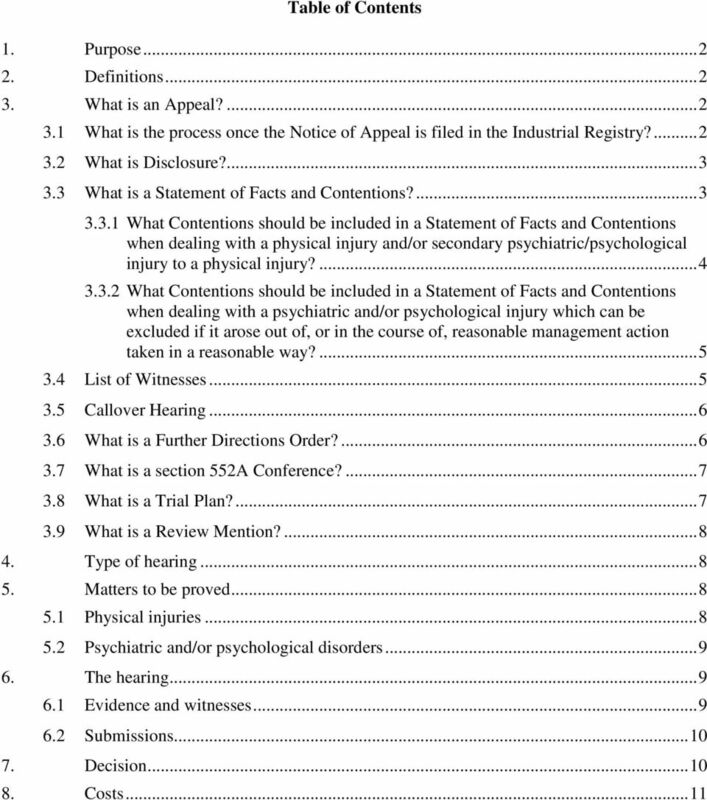 7 3.5 Callover Hearing 6 Following the filing of the Statements of Facts and Contentions by the parties, the Appeal will progress to the Callover Hearing for the purpose of issuing a Further Directions Order, including hearing dates, by the Vice President. At the Callover Hearing, the Vice President will ask both parties for the following basic information: the nature of the Appeal; the availability of expert witnesses; the names of the persons representing the parties e.g. Barristers, Solicitors, Agents or selfrepresented; the number of days required for the hearing; and the location of the hearing e.g. Brisbane, Cairns, Mt Isa etc. The Vice President will then issue directions for the further conduct of the matter. Those directions will then be put in writing and sent to the parties after the Callover Hearing. These directions which will generally be known as a "Further Directions Order". 3.6 What is a Further Directions Order? 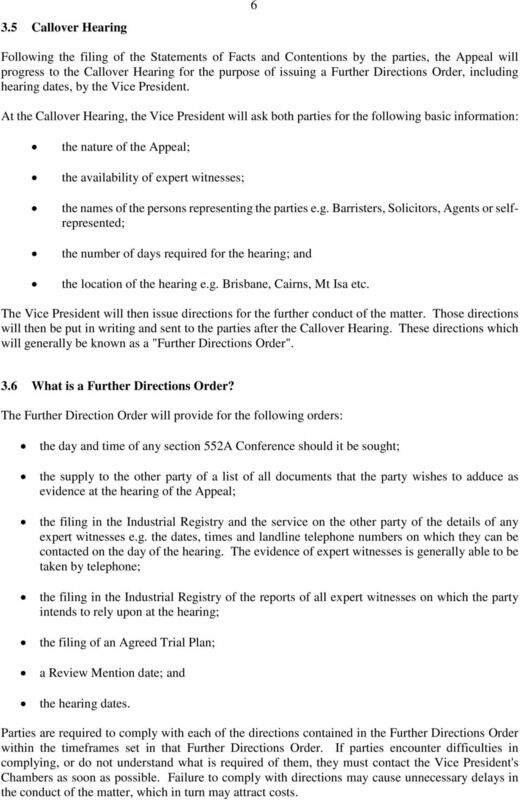 The Further Direction Order will provide for the following orders: the day and time of any section 552A Conference should it be sought; the supply to the other party of a list of all documents that the party wishes to adduce as evidence at the hearing of the Appeal; the filing in the Industrial Registry and the service on the other party of the details of any expert witnesses e.g. the dates, times and landline telephone numbers on which they can be contacted on the day of the hearing. 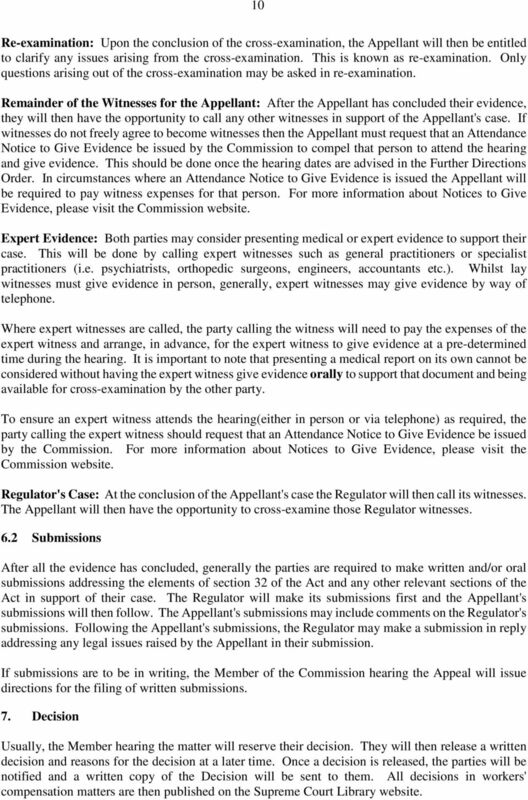 The evidence of expert witnesses is generally able to be taken by telephone; the filing in the Industrial Registry of the reports of all expert witnesses on which the party intends to rely upon at the hearing; the filing of an Agreed Trial Plan; a Review Mention date; and the hearing dates. Parties are required to comply with each of the directions contained in the Further Directions Order within the timeframes set in that Further Directions Order. If parties encounter difficulties in complying, or do not understand what is required of them, they must contact the Vice President's Chambers as soon as possible. Failure to comply with directions may cause unnecessary delays in the conduct of the matter, which in turn may attract costs. 9 8 will then give the representative five (5) or ten (10) minutes to finish examining/cross-examining/reexamining the witness. 3.9 What is a Review Mention? Often, the Vice President will also list an Appeal for a Review Mention approximately two (2) weeks prior to the hearing dates. The aim behind holding a "Review Mention" is to ensure that all directions have been complied with and that the parties are ready to proceed to hearing without delay. Assuming that all directions have been complied with, the Vice President will then allocate the matter to a Member of the Commission for the hearing of the Appeal. 4. 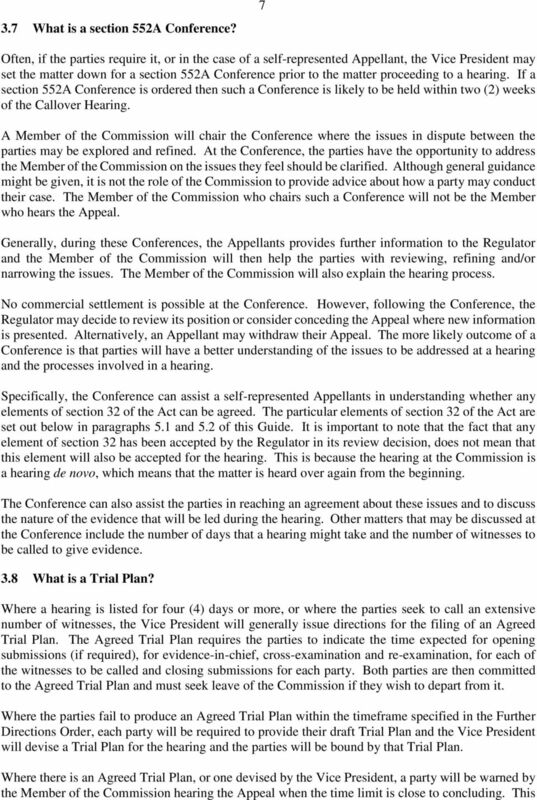 Type of hearing The hearing before the Commission is a hearing de novo. This means that the matter is heard again from the beginning and the Commission can accept evidence beyond the evidence that was before WorkCover Queensland/self-insurer and/or the Regulator. At the hearing it is the evidence and documentation adduced by the parties during the course of the hearing that the Member of the Commission will consider in making their decision on the Appeal. 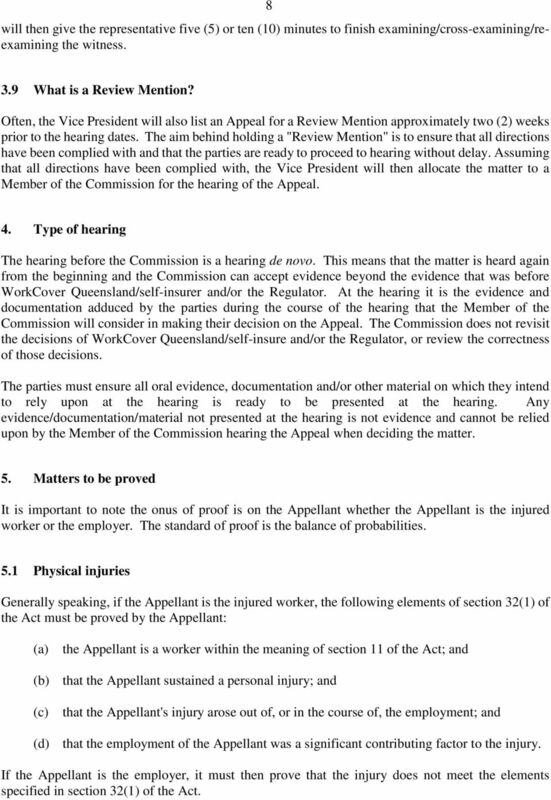 The Commission does not revisit the decisions of WorkCover Queensland/self-insure and/or the Regulator, or review the correctness of those decisions. The parties must ensure all oral evidence, documentation and/or other material on which they intend to rely upon at the hearing is ready to be presented at the hearing. Any evidence/documentation/material not presented at the hearing is not evidence and cannot be relied upon by the Member of the Commission hearing the Appeal when deciding the matter. 5. Matters to be proved It is important to note the onus of proof is on the Appellant whether the Appellant is the injured worker or the employer. The standard of proof is the balance of probabilities. 5.1 Physical injuries Generally speaking, if the Appellant is the injured worker, the following elements of section 32(1) of the Act must be proved by the Appellant: (a) the Appellant is a worker within the meaning of section 11 of the Act; and (b) that the Appellant sustained a personal injury; and (c) that the Appellant's injury arose out of, or in the course of, the employment; and (d) that the employment of the Appellant was a significant contributing factor to the injury. If the Appellant is the employer, it must then prove that the injury does not meet the elements specified in section 32(1) of the Act. 10 5.2 Psychiatric and/or psychological disorders 9 If the Appellant's injury is a psychiatric or psychological disorder, the following elements of section 32(1) of the Act must be proved by the Appellant: (a) the Appellant is a worker within the meaning of section 11 of the Act; and (b) that the Appellant sustained a personal injury; and (c) that the Appellant's injury arose out of, or in the course of, the employment; and (d) that the employment of the Appellant was the major significant contributing factor to the injury. 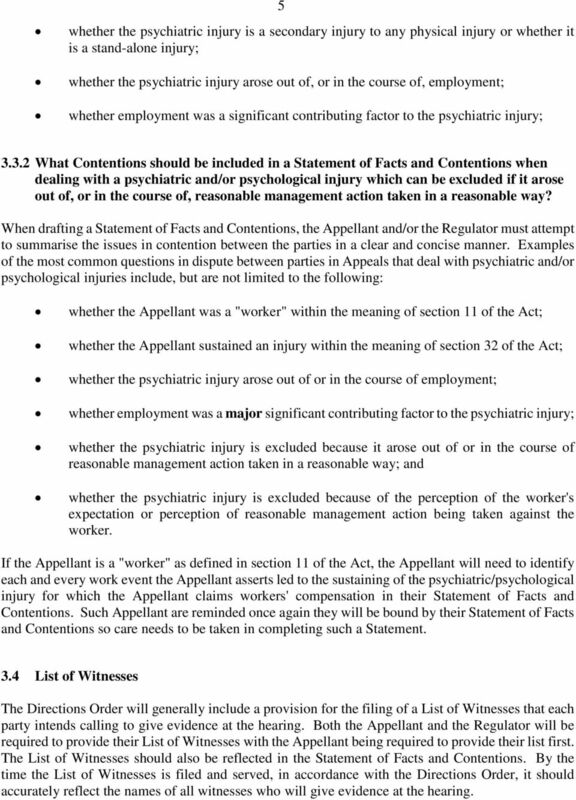 In addition, and in accordance with section 32(5)(a) the Appellant must also satisfy the Commission the psychiatric or psychological disorder is not withdrawn from section 32(1) of the Act because it arose out of, or in the course of, reasonable management action taken in a reasonable way. If the Appellant is the employer, it must then prove the disorder does not satisfy the elements in section 32(1) of the Act and/or that section 32(5)(a) of the Act applies because the psychiatric and/or psychological disorder arose out of, or in the course of, reasonable management action taken by the employer in a reasonable way. 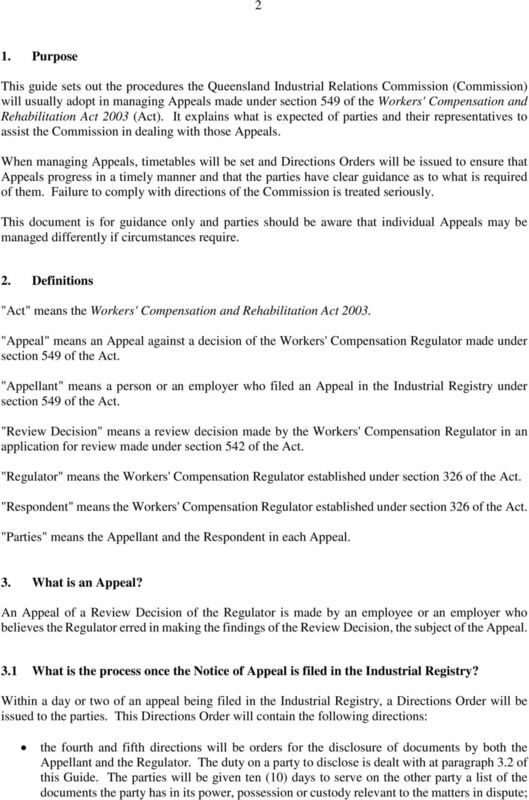 Under section 32(5)(b) of the Act, the Appellant employer may also prove that the injury is withdrawn from section 32(1) because of the worker's expectation or perception of reasonable management action being taken against the worker. The term "injury" does not include a psychiatric or psychological disorder arising out of, or in the course of, the worker's expectation or perception of reasonable management action being taken against the worker. The first element is management action taken against the worker and secondly, a consequent perception by the worker which does not accord with that of a reasonable person. 6. The hearing 6.1 Evidence and witnesses In workers' compensation matters, all evidence is adduced orally without affidavits or witness statements. Examination-in-Chief: All witnesses must give evidence under oath or an affirmation to the Commission. Where the Appellant is a worker, the Appellant will give their evidence first. The evidence is to consist of events that led to the Appellant sustaining the injury. Those events should be organized in chronological order and with sufficient enough detail to prove each of the elements of section 32 of the Act that are in issue: see paragraphs 5.1 and 5.2 of this Guide. As part of the examination-in-chief, the Appellant should tender (provide) to the Commission in their evidence or the evidence of their other witnesses, any documents relevant to the claim. Documents not tendered at the hearing will not be considered as evidence and the Member of the Commission hearing the Appeal will not take them into consideration in making the decision. Cross-examination: Following the conclusion of the Appellant's examination-in-chief, the Appellant will then be cross-examined by the Regulator's barrister. 11 10 Re-examination: Upon the conclusion of the cross-examination, the Appellant will then be entitled to clarify any issues arising from the cross-examination. This is known as re-examination. Only questions arising out of the cross-examination may be asked in re-examination. Remainder of the Witnesses for the Appellant: After the Appellant has concluded their evidence, they will then have the opportunity to call any other witnesses in support of the Appellant's case. If witnesses do not freely agree to become witnesses then the Appellant must request that an Attendance Notice to Give Evidence be issued by the Commission to compel that person to attend the hearing and give evidence. This should be done once the hearing dates are advised in the Further Directions Order. In circumstances where an Attendance Notice to Give Evidence is issued the Appellant will be required to pay witness expenses for that person. For more information about Notices to Give Evidence, please visit the Commission website. Expert Evidence: Both parties may consider presenting medical or expert evidence to support their case. This will be done by calling expert witnesses such as general practitioners or specialist practitioners (i.e. psychiatrists, orthopedic surgeons, engineers, accountants etc.). Whilst lay witnesses must give evidence in person, generally, expert witnesses may give evidence by way of telephone. Where expert witnesses are called, the party calling the witness will need to pay the expenses of the expert witness and arrange, in advance, for the expert witness to give evidence at a pre-determined time during the hearing. It is important to note that presenting a medical report on its own cannot be considered without having the expert witness give evidence orally to support that document and being available for cross-examination by the other party. To ensure an expert witness attends the hearing(either in person or via telephone) as required, the party calling the expert witness should request that an Attendance Notice to Give Evidence be issued by the Commission. For more information about Notices to Give Evidence, please visit the Commission website. Regulator's Case: At the conclusion of the Appellant's case the Regulator will then call its witnesses. The Appellant will then have the opportunity to cross-examine those Regulator witnesses. 6.2 Submissions After all the evidence has concluded, generally the parties are required to make written and/or oral submissions addressing the elements of section 32 of the Act and any other relevant sections of the Act in support of their case. The Regulator will make its submissions first and the Appellant's submissions will then follow. The Appellant's submissions may include comments on the Regulator's submissions. Following the Appellant's submissions, the Regulator may make a submission in reply addressing any legal issues raised by the Appellant in their submission. If submissions are to be in writing, the Member of the Commission hearing the Appeal will issue directions for the filing of written submissions. 7. Decision Usually, the Member hearing the matter will reserve their decision. They will then release a written decision and reasons for the decision at a later time. 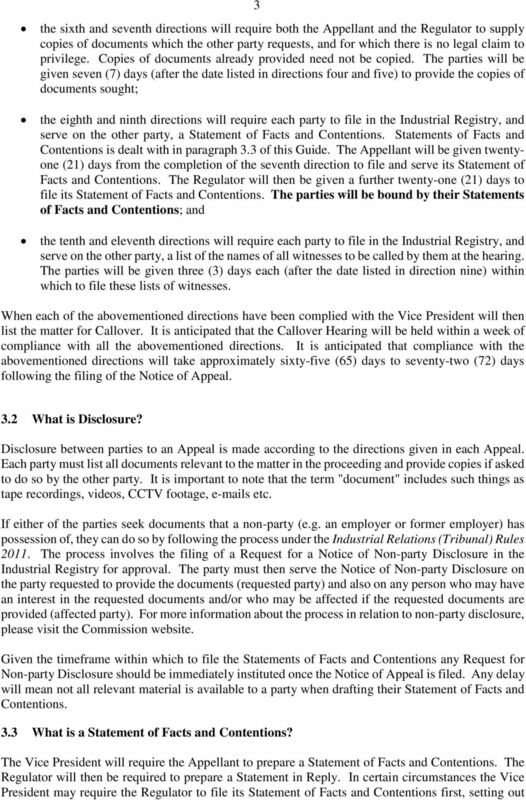 Once a decision is released, the parties will be notified and a written copy of the Decision will be sent to them. All decisions in workers' compensation matters are then published on the Supreme Court Library website. 12 8. Costs 11 Generally, in workers' compensation appeals, costs follow the event. This means that the unsuccessful party will usually be required to pay the costs of the other side. Where an Appellant is self-represented and is successful in the Appeal, the costs awarded are generally limited to the costs incurred by the calling of witnesses, particularly expert witnesses. If the Regulator is successful in defending the Appeal then any costs order against the Appellant will include the costs of the Regulator's barrister for the preparation of their defence of the Regulator's decision, conferencing of witnesses and their appearance in the Commission on all days of the hearing. Any costs order in workers' compensation matters is based on Regulation 113 of the Workers' Compensation and Rehabilitation Regulation 2003 i.e. 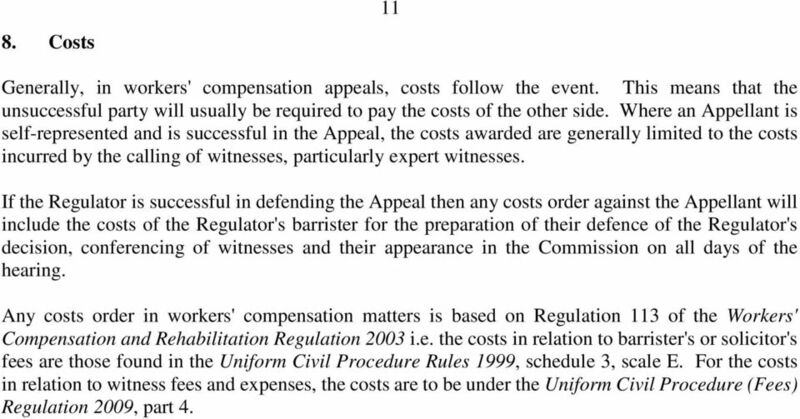 the costs in relation to barrister's or solicitor's fees are those found in the Uniform Civil Procedure Rules 1999, schedule 3, scale E. For the costs in relation to witness fees and expenses, the costs are to be under the Uniform Civil Procedure (Fees) Regulation 2009, part 4. The Tribunal Procedure (First-tier Tribunal) (Tax Chamber) Rules 2009 (S.I. 2009/273 (L.1)) As in force on 1 st April 2013 This document shows the Rules as amended by S.I. 2010/43, S.I. 2010/2653, S.I. What is taxation of costs? The practice and procedure governing hearings pursuant to this Part shall be made by a Policy. RULE 10 FUNDS HELD BY THE CLERK 10.1 General. A Judge of the District Court may order that any monies in actions pending before the Court be invested in any local financial institution for safe keeping. Part 15 Experts. (5) Copies of the report shall be forwarded by the clerk to the parties or their solicitors.